Hello! 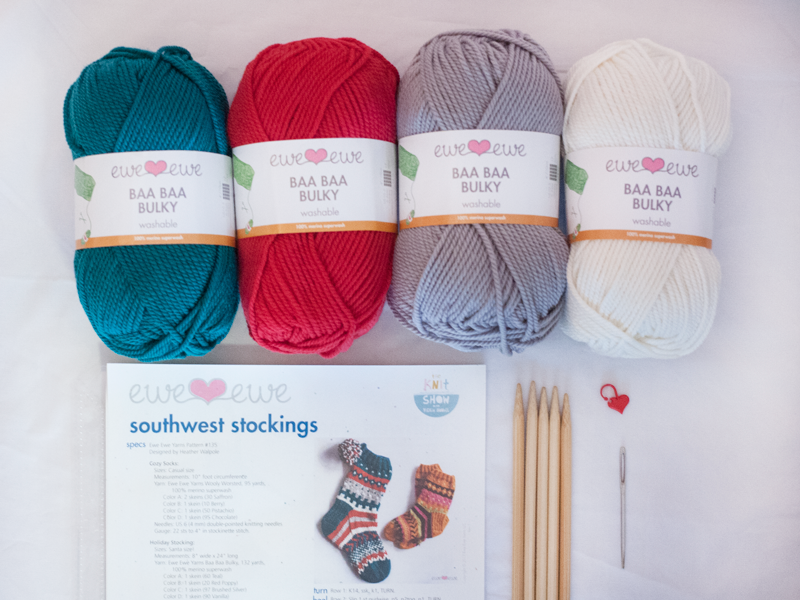 Welcome to Day 3 of the Southwest Stockings Knit Along. 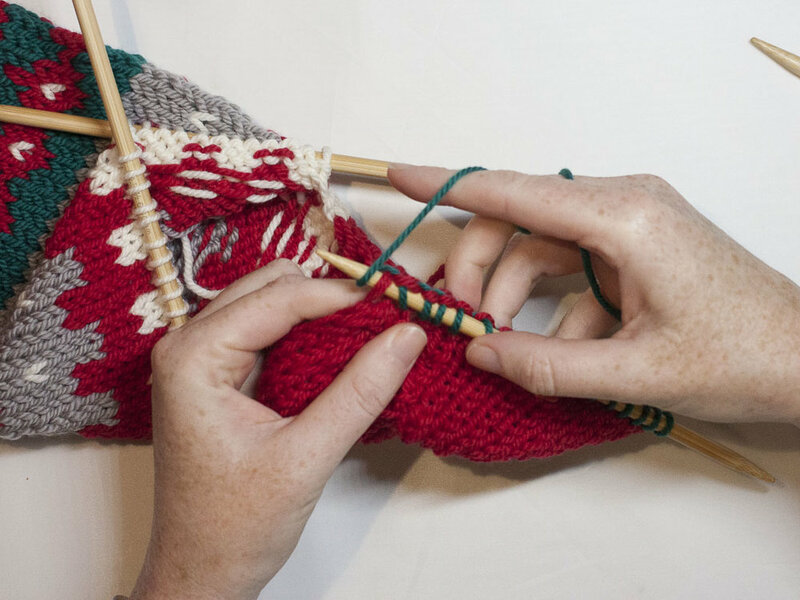 Today we're going to close the toe of the sock and learn to graft stitches with the Kitchener stitch. The Kitchener stitch is something that gets a bad wrap in knitting but I think it's fun to work. We only have 12 stitches to close so it's just the right amount to learn on and practice your skills. 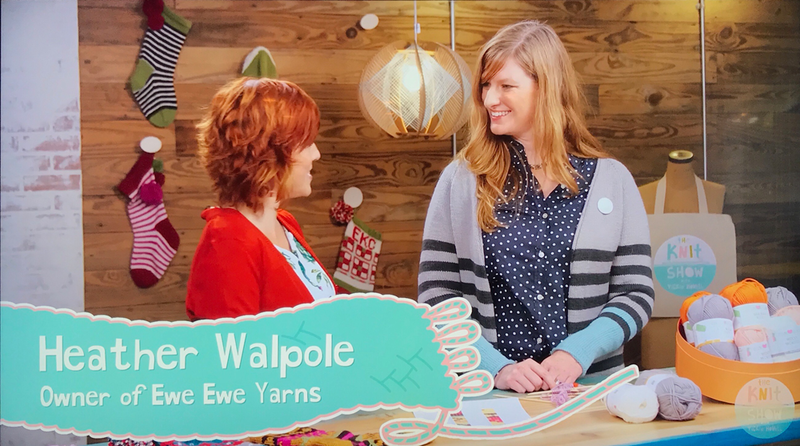 Remember, you can always watch me work these steps on The Knit Show with Vickie Howell. Here we are, we've worked all the stitches on the Fair Isle chart and we're ready to narrow the end of the sock to close around the toes. Break any remaining yarn colors and take a moment to admire your sock knitting accomplishment. To close the toe we work Rounds 1 and 2 of the toe section. Round 1: K to the last 3 sts on Needle 1, k2tog, k1; Needle 2, k1, ssk, k to end; Needle 3, k to the last 3 sts, k2tog, k1; Needle 4, k1, ssk, k to end. Repeat these two rounds until 28 sts remain. Here's what the toe will look like at this point. Then we continue to work Round 1 until just 12 stitches remain. 3 on each needle. To get ready for the Kitchener stitch we need to have all the stitches organized in a specific way. We're going to take it down to just two needles -- here's how. Knit across 3 sts on Needle 1 to set up for Kitchener Stitch. Slip stitches from Needle 2 on to Needle 3. There should now be 12 sts arranged on 2 needles with 6 sts on each. 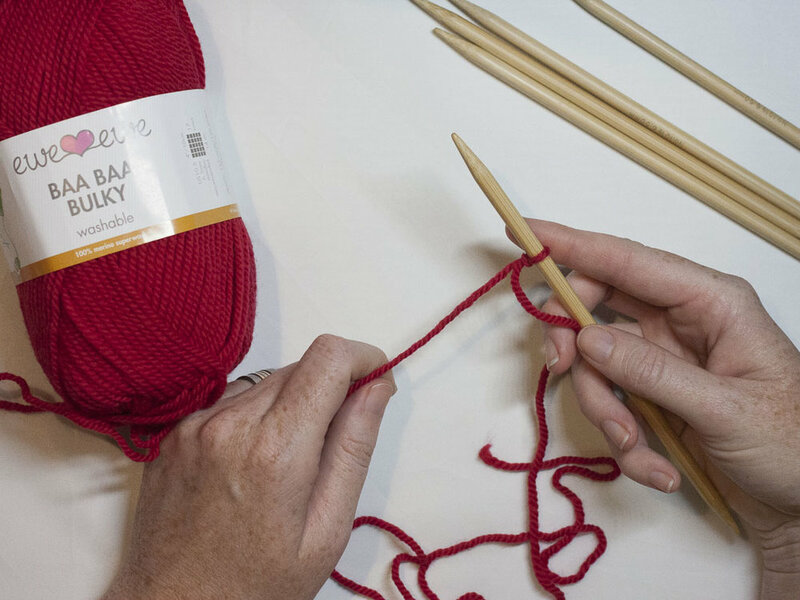 Arrange the needles with wrong sides facing each other and the yarn coming from the first stitch on the back needle. Cut yarn leaving an 18” tail. Thread a darning needle with the yarn tail. Now we're ready to get started! We are going to be knitting and purling these stitches but we use the threaded yarn needle to work them. We get started with two setup sittches. Kitchener Setup: Insert the yarn through the first stitch on the FRONT needle as if to PURL and pull yarn through leaving the stitch on the needle. Insert the yarn through the first stitch on the BACK needle as if to KNIT and pull yarn through leaving the stitch on the needle. 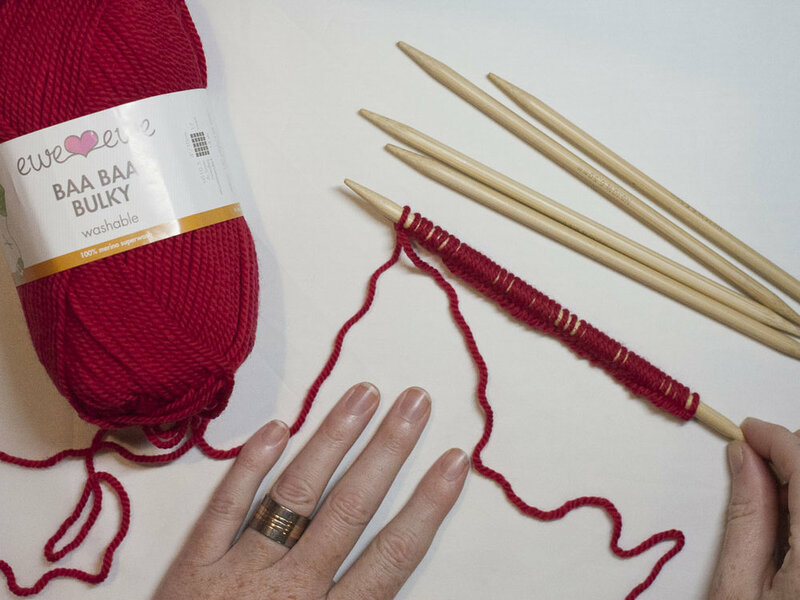 Step 1: Insert yarn through the first stitch on the FRONT needle as if to KNIT. Slip the stitch OFF the needle. Step 2: Insert yarn through the next stitch on the FRONT needle as if to PURL. Leave the stitch ON the needle. Step 3: Insert the yarn through the first stitch on the BACK needle as if to PURL. Slip the stitch OFF the needle. Step 4: Insert the yarn through the next stitch on the BACK needle as if to KNIT. Leave the stitch ON the needle. Repeat Steps 1-4 across the row adjusting the yarn and stitch tension to match your knitting. Weave in all yarn ends. There we go! The toe is closed and it just looks like another row of knitting. The best part is that there's no uncomfortable seam inside that would irratate your little tootsies. Take the time to securely weave in the yarn tail from the Kitchener stitch. And there! We have a finished sock! Can you believe it? 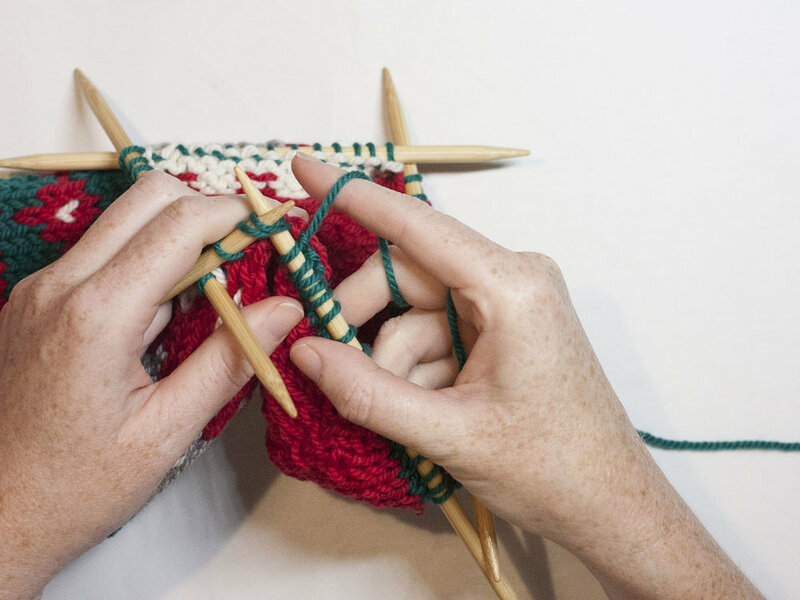 If you're making the Cozy Socks now is the time to get started on the second sock. A finished pair is always better than having one cold foot so be sure to work all the way to the end. 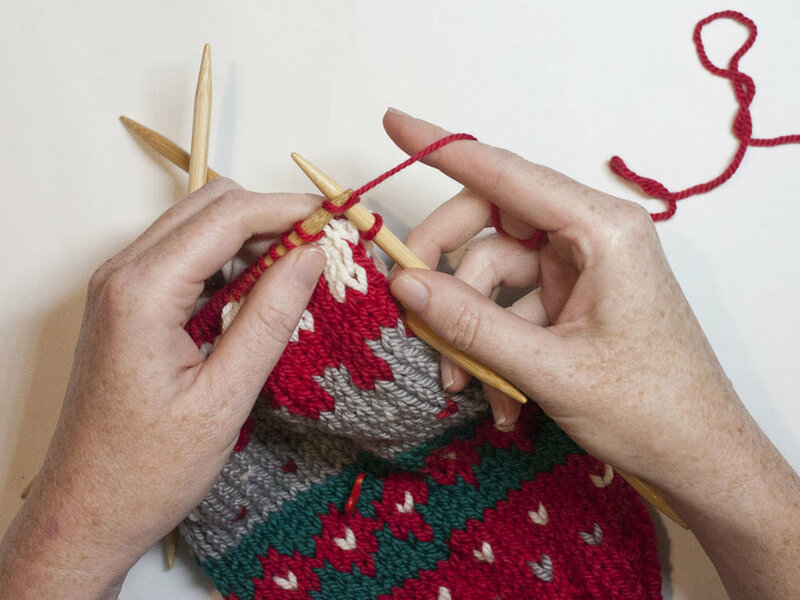 If you're knitting the Christmas Stocking then meet me back here on Tuesday for the finishing steps like making a hang loop and an adorable pom pom to adorn the top. Here we go! It's Day 2 of the Southwest Stockings Knit Along and today we've worked the ankle of the sock and we're ready to start the heel flap and then turn the heel with short rows. It's fun to knit in a different direction like this. I've got a lot of pictures here for you but if you have any questions be sure to leave a comment! Remember you can always watch me knit these steps on The Knit Show with Vickie Howell. The heel flap is only worked with Color A so we can cut any other strands we have remaining. Now with A we knit across Needle 1. Then... we TURN the work. There's the inside of the stocking. 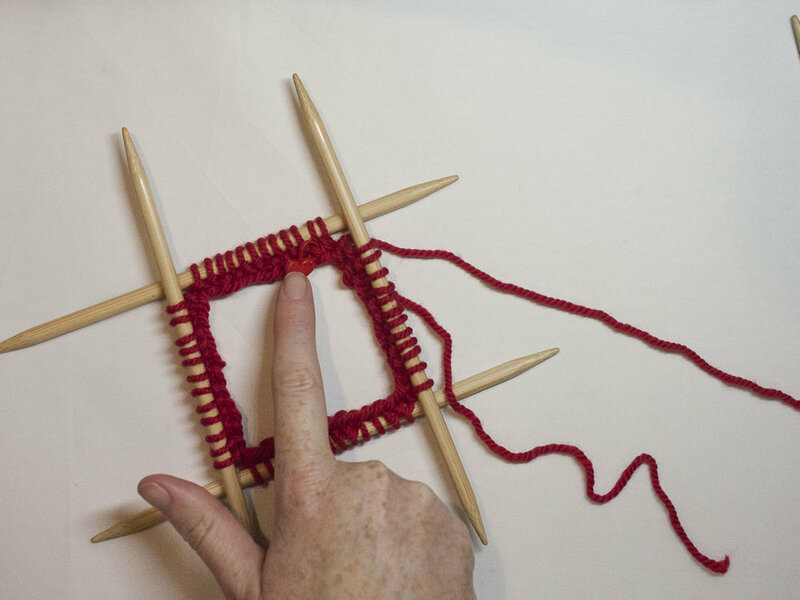 Slip the first stitch as if to purl and then purl the rest of the stitches on Needle 1 and across to Needle 4. Now we have 24 stitches all on one needle with Needles 2 and 3 holding the other half of the stitches and waiting patiently for us to return to them. To work the heel flap stitches we slip 1 stitch as if to purl, then knit 1 stitch. Alternate these two moves across the row. And, turn. Slip the first stitch and then purl ALL the other stitches back across. As you continue these two rows you'll see this squishy fabric start to happen. This makes a reinforced heel on a regular sock and it's a good technique to know so we do it the same way for the Christmas stocking. Plus, it looks cute on a project of that scale! The pattern tells us to "Repeat these two rows for 24 rows total. There will be 12 chain stitches on each of the new edges. These are what we're looking for -- 12 chains, here I have 8. Continue on until you have completed the heel flap. It should look something like this. Now we start the fun of short rows! It sounds scary but I think this is the most fun part of making a sock. This is the part of the sock that wraps from the back of the foot and hugs the heel. It's a fun adventure that will amaze you if you haven't done it before! Knit across 14 stitches. Just plain knit, no slipping here. Next you're going to decrease with SSK or slip, slip, knit. To perform this decrease slip one stitch knit-wise, slip a second stitch in the same manner. 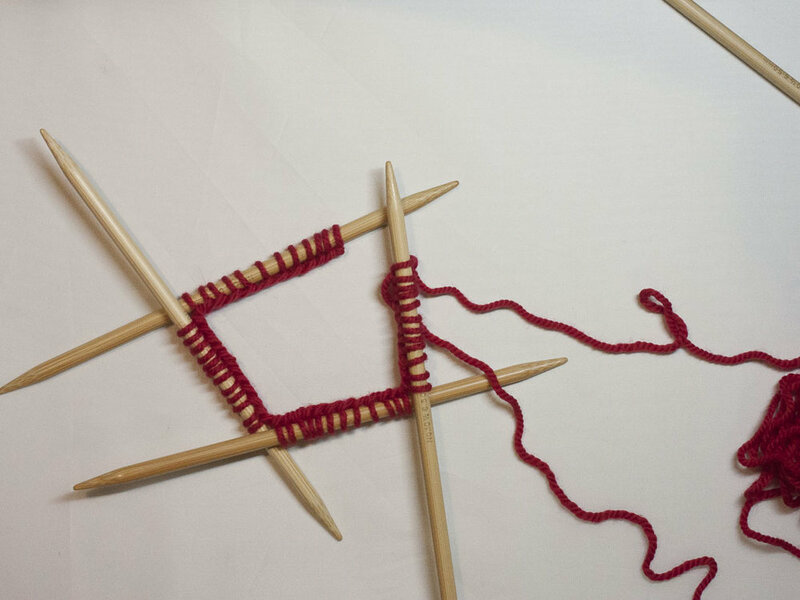 Then insert the left needle into the front of the two slipped stitches and knit them together. That's an SSK. Now knit 1 stitch and TURN. Now you'll start working back and forth as the pattern says. You will be able to see a gap forming where you have turned your work. Can you see the gap in the middle of my row? Continue working the two rows until 16 stitches remain on your needle. Wow! Isn't that awesome? Look that how the heel just suddenly appears. We're all set and ready to join the bottom of the heel flap back to the rest of the sock. 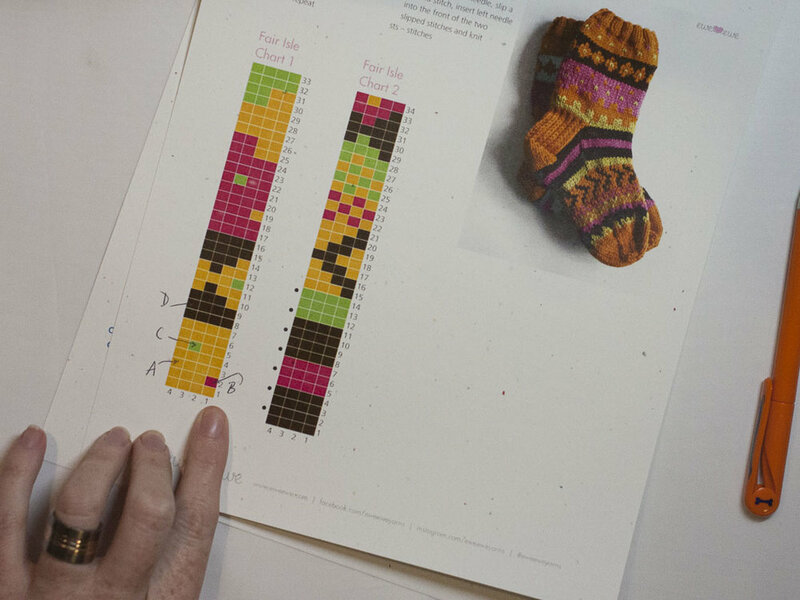 Cut Color A and begin following Fair Isle Chart 2 on page 3. 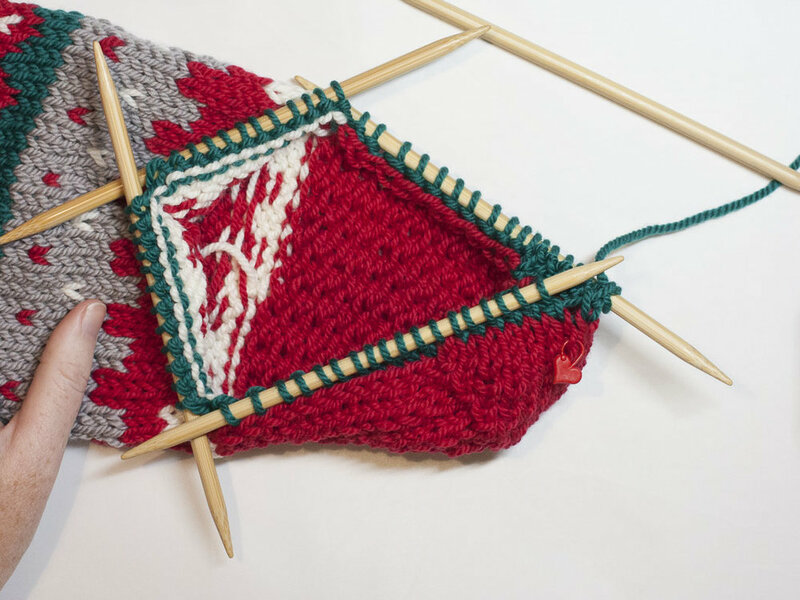 With Color D as the chart shows, knit across 14 stitches from the base of the heel. Rotate your work slightly. We will now be picking up stitches down the edge of the heel flap. Insert your needle in to the large, slipped stitches on the edge of the heel flap, wrap your yarn around the needle and pick up a stitch. 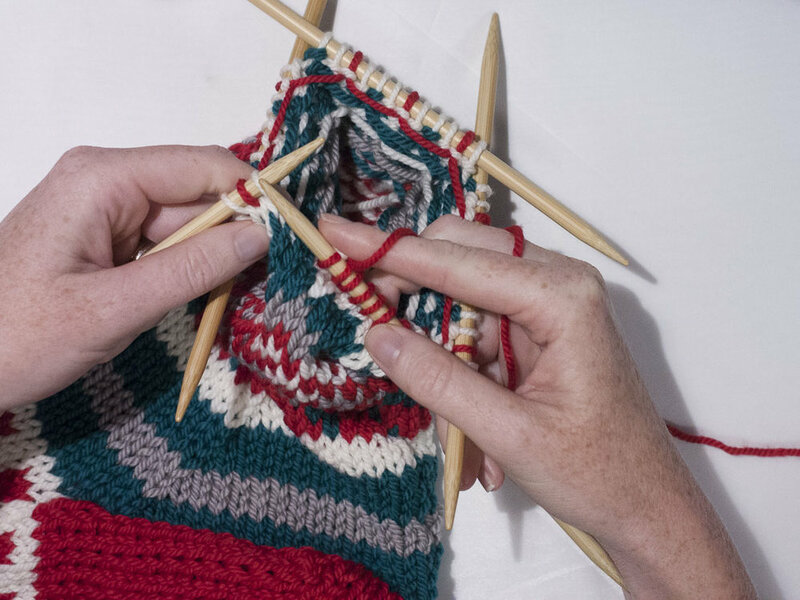 Continue picking up stitches along the heel flap until you have 12 additional stitches on your needle. This needle looks a little intense with all those stitches but we will even it out as we work our way around. From Needle 1 head to Needles 2 and 3 to work those stitches that have been waiting for us. Then we get back to the other side of the heel flap. 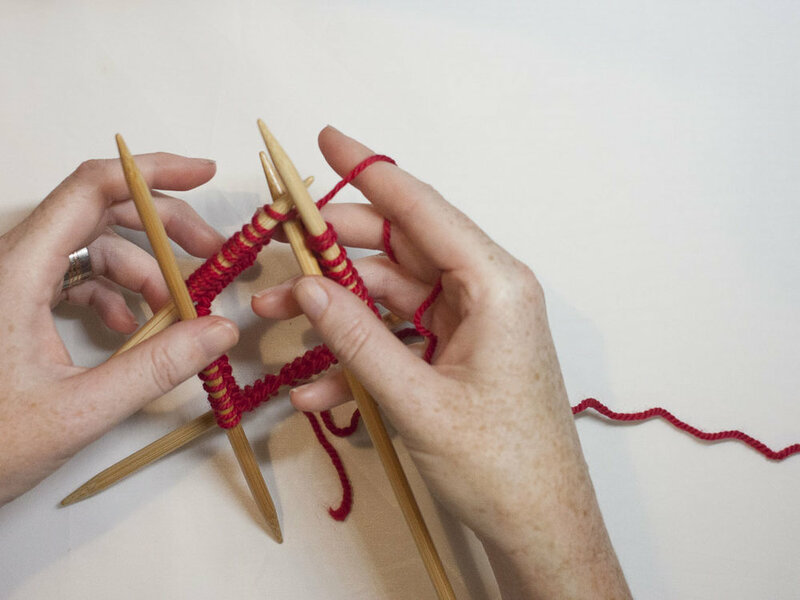 Pick up 12 stitches down the edge in the same manner as the first side. Now we're left with this offset orientation. Knit across 7 stitches from Needle 1 directly on to Needle 4. Ahh, happy organized sock needles! You'll have 19 stitches on Needles 1 and 4 and 12 stitches on Needles 2 and 3 for a total of 62 stitches. Woohoo! Success at socks. Ok, so we have a ton of stitches now but we don't need that many forever. This is where we start decreasing to get the sock back to 48 stitches. On the Fair Isle Chart I placed a little dot next to each row where you'll be making a decrease. You'll do 2 decreases on these rows and that happens 7 times. 62 - 14 = 48! To decrease on Needle 1: Knit to the last 3 stitches, k2tog, k1. Work across Needles 2 and 3 as normal. To decrease on Needle 4: K1, SSK (just like we did on the heel), knit to the end of the round. And there we have it! A sock heel is born. Continue decreasing and working Fair Isle Chart 2. If you're making the Cozy Socks when you get to the end of the chart you can try the sock on for size. Be careful with those needles but slip it over your foot to check the length. The sock should be about 1 and a half inches less than the length of your foot. 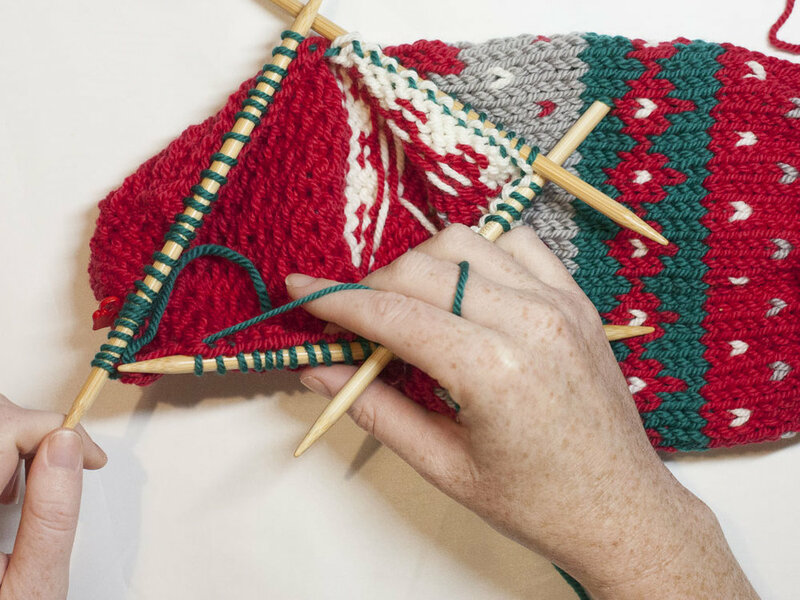 If you think it needs to be a bit longer add a few more rows by making up your own Fair Isle stitch combination, adding stripes, or working your favorite section of the charts again. I'll be back on Thursday the 16th to talk about decreasing for the toe and finally grafting our stitches together to close the sock using the Kitchener stitch. The pattern is exactly the same for both projects. 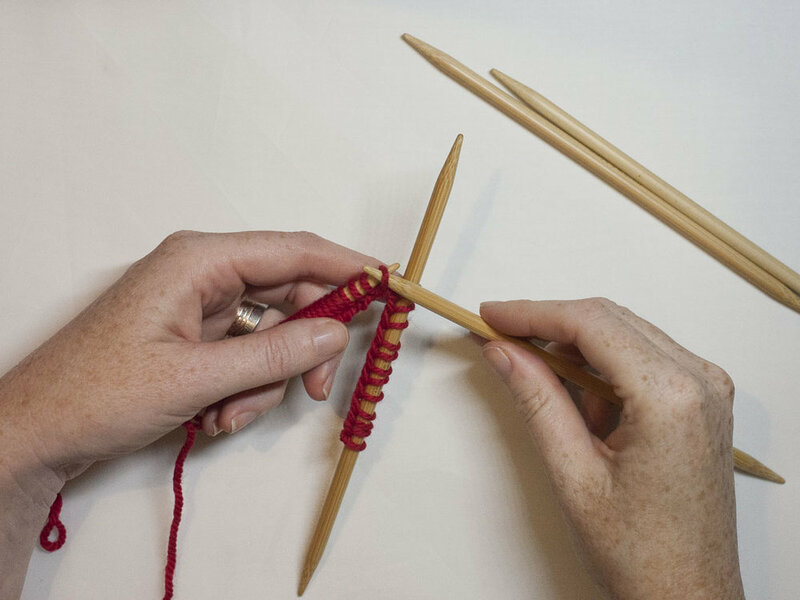 The only difference is the needle size and yarn weight (and if you knit the Cozy Socks you need to knit two!). You can choose any colors of Baa Baa Bulky to fit your home or take a look at the color combo kits we put together. These kits contain enough yarn to complete the project. 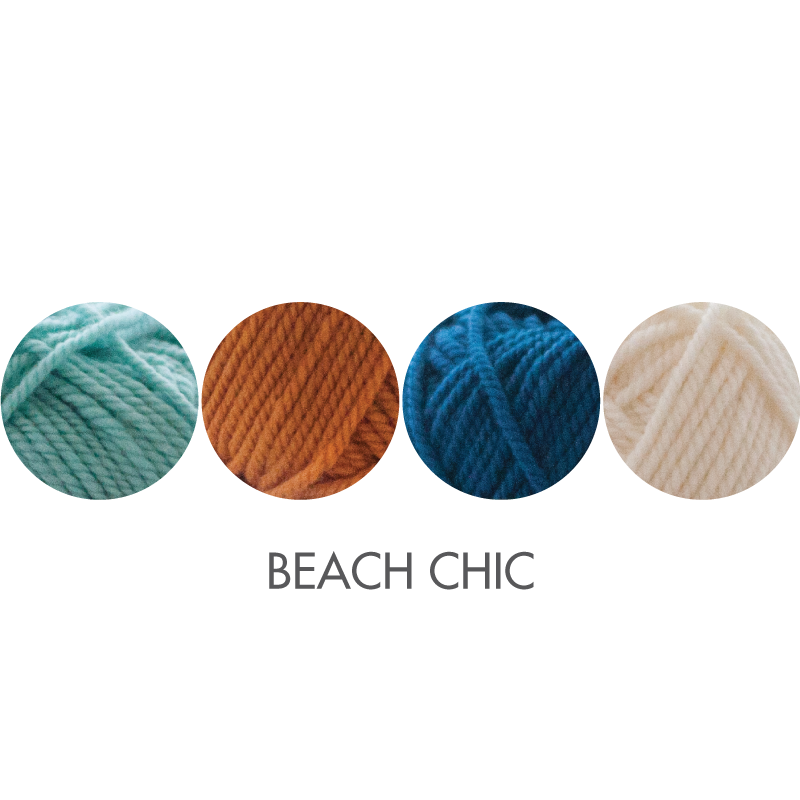 You can choose any colors of Wooly Worsted to fit your style or take a look at the color combo kits we put together. These kits contain enough yarn to complete the project. If you want to browse through our color kit ideas you can take a look at the Christmas Stocking kits and the Cozy Sock kits here on our website then buy at your favorite shop.